Are you looking for a rolling marketing opportunity for your small business or chamber of commerce? 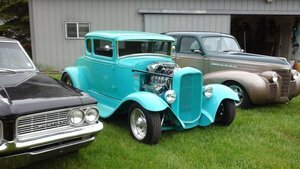 MotoeXotica Classic Cars has an opportunity for you in this 1930 Ford Model A Woody Panel Truck which was well cared for by the previous owner of 13 years. Dressed in Burgundy for its hood, cowl, windshield frame and wings, the roof, doors and cargo area are all fashioned in wood, creating a handsome panel delivery truck with loads of charm. Overall the paint, trim and wood sections are in great condition, with just minor imperfections visible at close range. The truck’s windows are in very good order, clear and intact, as are its lights. The headlights and optional cowl lights all have silver shades. 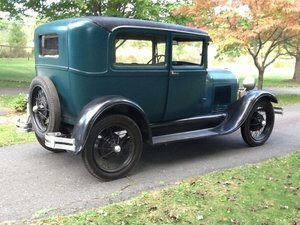 This Model A’s bodywork is straight and solid while the cargo area looks clean and solid. It is approximately 46.4 inches wide and more than 59 inches long. It would be a good place to haul small parts, beverage cases, office supplies, etc. This A’s two-bar chrome bumpers are in very good order. Other features include dual sideview mirrors, a driver’s side windshield wiper, taillight and side-mounted spare tire. This Ford rolls on BFG Silvertown tires, size 4.75/5.00-19. Each one is mounted on a red metal wire wheel, including the spare tire. Under the vee’d hood is Ford’s 201 CID L-head inline four-cylinder. Backing up that engine is a three-speed sliding gear manual transmission. Inside, the black bench seat is in excellent condition. There’s no carpeting under the driver’s feet but there are black mats that are in good condition. Above the driver’s head is a wooden headliner that looks great. A four-spoke steering wheel faces the driver is in great condition. The red and burgundy metal instrument panel looks great while the inner door panels are in excellent condition. The wipers, speedometer/odometer and fuel gauge are inoperable. Some of this Ford’s competition in 1930 included Chevrolet’s Series AD Universal and Plymouth’s 30U Commercial Sedan. Ford Model A fans as well as those looking to boost public relations for their business, would do well to stop by MotoeXotica Classic Cars to inspect this Model A Wood Panel Delivery. This car is currently located at our facility in St. Louis, Missouri. Current mileage on the odometer shows 20,372 miles. It is sold as is, where is, on a clean and clear, mileage exempt title. GET OUT AND DRIVE!!! OR COPY AND PASTE OUR LINK!!! !